OREOs are always a treat, and these cookie ball truffles are a great way to enjoy them over the holidays! So now that the Christmas season is in full swing, I thought this would be the perfect time to make them. They’re easy to make and all you need are a few ingredients–OREO cookies, cream cheese, and chocolate–plus an extra ingredient I added! I decided I’d make these cookie balls a little extra chocolatey by adding in some mini chocolate chips (you need to use the mini chips–the regular size would be much too big)! And I used both semi-sweet and white baking chocolate to coat them for a little variety. I topped these yummy treats with different kinds of Christmas sprinkles, coconut, and crushed candy canes. Chopped nuts would also be a great topping. You can make these cookie ball truffles without the mini chocolate chips if you prefer; you’ll get about 48 if you make them that way. If you make them with the mini chocolate chips like I did, you’ll get at least 70 truffles, maybe a little more, so you may want to have an extra 4-ounce package of baking chocolate on hand in case you need more chocolate coating. I had just enough chocolate to coat all of mine with the 4 packages, but it never hurts to have a little extra on hand. I also added 1/2 teaspoon of coconut oil per bar of baking chocolate–I mixed the coconut oil into the chocolate after it was all melted–it made the chocolate a little thinner and easier to dip the cookie balls in. I also found it was easiest to dip these cookie ball truffles into the chocolate by using a regular spoon, turning each one over in the melted chocolate with the spoon until it was all coated. Then I immediately put it on a parchment-lined pan, using the spoon to drop it on. After dipping about 5 cookie balls, I adding toppings before the chocolate started setting–the toppings adhere much better when the chocolate coating is still very melty. So that’s all there is to it! 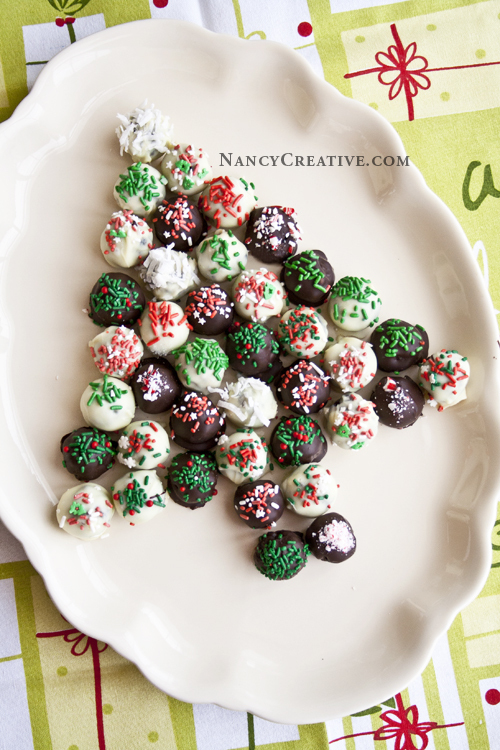 And I thought it would be fun to arrange these cookie balls in a tree shape–a great way to serve them at a holiday party or get-together! Mix cream cheese and cookie crumbs until blended. Shape into 70 (1-inch) balls. Place in a shallow 10 x 15″ pan lined with parchment paper and freeze for 10 minutes. For cookie balls, dip each ball into melted chocolate. Place in single layer in your lined 10 x 15″ pan (I dipped about 5 at a time, then sprinkled them, so the toppings would stick well before the chocolate started setting). You may need to use an extra lined pan, since you’ll need to leave more space between the chocolate coated cookie balls while they’re setting. After dipping and topping all the cookie balls with your choice of sprinkles or toppings, refrigerate them on your lined pan or pans for 1 hour or until firm. Do you like Oreos too? Have you made these cookie balls and do you have a special way of making them? Sharing at Candy Plan Monday, Christmas Cookie Swap at Katherine’s Corner. 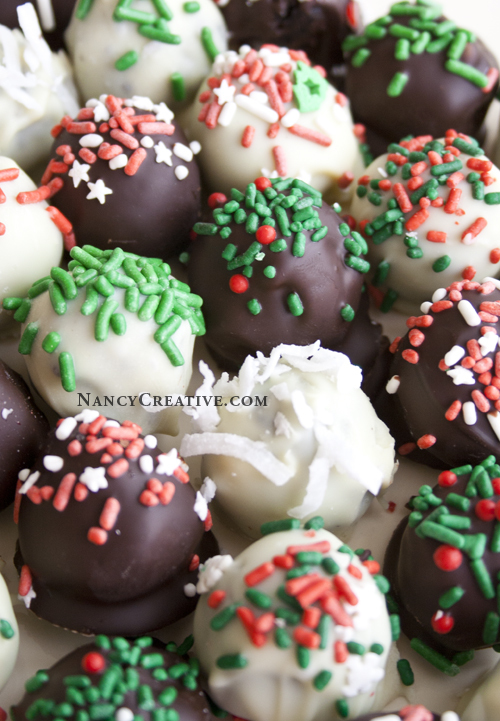 This entry was posted in Candy and Confections, Entertaining, Food and Recipes, Food Gifts, Food Presentation, Seasonal, Winter/Christmas and tagged Chocolate chip, Christmas, Cookie, cookie truffles, Oreo, semi-sweet chocolate, Sprinkles, White Chocolate on December 2, 2013 by nancyc.